We always buy a ton of fresh produce and come the end of the week seem to have a little of this and little of that leftover. Well, we absolutely hate wasting food so today's lunch was inspired by our leftover produce and boy did it turn out delicious! We started off our salad with a bed of fresh watercress, although spicy arugula or spinach would be just as tasty! 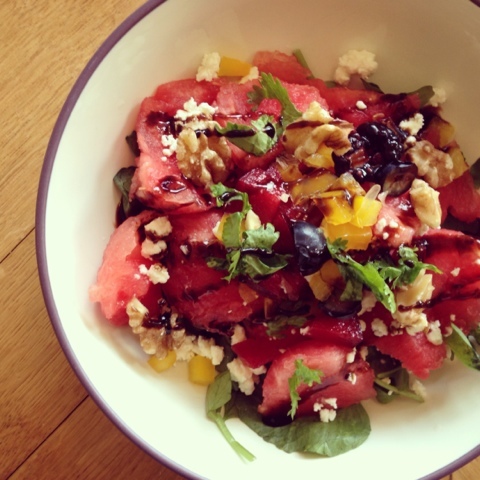 We love watermelon and wanted to base this salad around our favorite summertime fruit. We then topped our salad with fresh blueberries, blackberries, juicy plum, yellow pepper, walnuts and just a tablespoon of fresh feta cheese! Talk about a beauty, right? 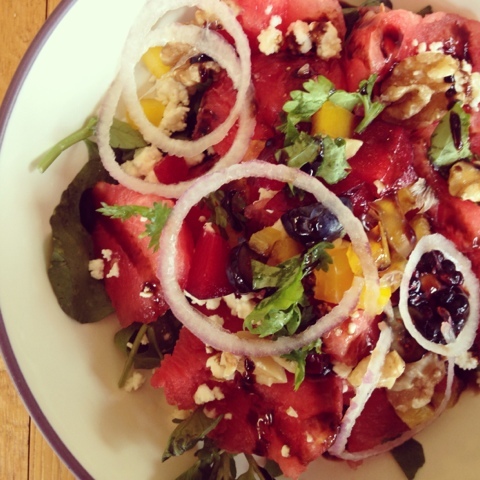 We garnished this salad with thinly sliced red onion, fresh cilantro, balsamic glaze and freshly squeeze lemon juice! Yum, this was absolutely delicious! Fresh fruits and veggies are simply meant to come together and hang out in one giant bowl. Feel free to use this yummy combination or simply use whatever you have on hand. That's the beauty in this leftover produce turned delicacy dish! 1. Line each bowl with watercress. Top with 1.5 cups watermelon. 2. Continue topping with 1/4 of remaining ingredients - blueberries, blackberries, yellow pepper, plums, walnuts, and feta. 3. Squeeze fresh lemon juice over top. 4. Garnish with balsamic glaze and fresh cilantro.